Yesterday I got up at 5am, which was easy because Rocco's feet were digging into my ear all night anyway. Quickly showered, dressed, and jumped in the car, to go and meet the people from Ford. In Melbourne. I've only ever been to Melbourne once before and I hardly remember any of it. Sitting on the plane next to Chantelle and Simone, I cracked jokes about the plane crashing, to make Chantelle feel better. We met Melissa at Melbourne airport, and got chauffered by the spunky Maree from Kidspot - in a Ford Territory - to attend the Melbourne Motor Show. Which ended up being not nearly as boring as I thought it would be. There were the other two finalists, Sandra and Kel. It was a pleasure, and I will never tire of meeting other bloggers in the flesh. 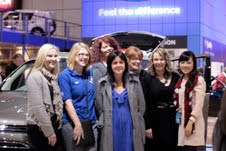 From left: Simone from Honey and Fizz, the famous Ford Territory Engineer Jess Riseley, Sandra from $120 Food Challenge, me with my flimsy fake tooth, Melissa from One Crafty Mumma, the delectable Yutong from Ford, and at front in the blue dress is Kel from 1000 Homes for Happiness. Moving quickly on to lunch, where these babies were waiting for us. The place setting. I ended up smuggling the apple back to Sydney in my handbag .. it was the most handsome apple I have ever seen. The best part of the day was the talking over lunch. A fascinating discussion between the bloggers, the PR's, the Kidspotters, and the Ford people themselves, regarding the use of social media. Particularly, how companies are just starting to catch on to the power that bloggers can wield. Ford are leading the way in Australia, and it's been a real pleasure to be involved in this campaign. I almost didn't enter it at all, because I thought it would be too hard to maintain the balance of blogging and mentioning Ford on my blog. I'm glad I did, even though it was tricky at times to write about something because I "had" to, not because I wanted to. On asked what the best part of blogging was for me, my answer was you. My favourite section of this blog is the comments. You tell me things that I don't know, and I honestly thought I knew everything! Dave's work magnets have been on the Territory the whole time, so people talk to him about it a lot. The only person who ever talked to me about it was the guy in the main drag of Katoomba last week. I was using the parking camera, and knew it was going to be a tight squeeze. But I am the world's best reverse parker, so knew I would be fine. Suddenly I hear this THWACK and I thought, oh my god I crashed the Ford. Looked up to find that he had smacked my car with his open hand. To stop from reversing into his precious Audi. He walked around to my window, where I deigned to buzz it down. Both furious at each other. "YOU ALMOST REVERSED INTO MY CAR!" I motioned to the reverse camera screen, and said Mate, I have a camera - no I wasn't! Then he said something really annoying, so I asked him to please go make love to himself! (Using much coarser language). Buzzed up my window, leaving him spluttering in the street. Good on you, Ford. It was such a cool and engaging thing to do, to hand over five cars to complete strangers. (For all they know, one of them could have outrun the cops because they were running late to a dentist appointment last week.) A huge thank you as well - when our electricity was down for three days, that DVD player and heated interior saved us. So. I did not crash the Ford, the plane back to Sydney didn't crash, and it took fifteen hours to travel from the Blue Mountains to go to a fancy lunch in Melbourne and back. Hi blogger - why the long day? As I drove out of the airport carpark to start the trek home in peakhour, I read all of the amazing comments on my last post. My friend Crow simply wrote out the lyrics to No Woman, No Cry. So I decided to download that song right then on my iPhone and listen to it all the way home. But my transaction was declined because I don't even have $1.69 in my bank account. (Is there money to be made from blogging? Not sure.) So I just hummed the song instead. Then, I almost crashed the Ford AGAIN but didn't! Two and a half hours later I walked into my front door. Rocco came running up, and with no hello in sight, grabbed the handsome green apple out of my hands. "MY APPLE!" What a day! And I too have been declined on iTunes for a pittance amount. If anyone can make money from blogging, I'm pretty sure you could! Love that Rocco nicked the apple! Haha, he's a champion! I'm just glad you are home. Where you belong. As far as I'm concerned you haven't lived until you've been rejected by iTunes. Or copped a $40 bank fee because you didn't have the $3.99 to buy Blogpress in the bank yet they still took it out. Oh and I would have not so kindly told that Audi wanker that he makes love to his mother. Asswipe. I'm glad the plane or car didn't crash and you enjoyed the limited time you had in Melbourne. Nothing like your kid to bring your special day to a screeching halt! How much longer do you get to keep the Ford? what a day huh? nothing like an interstate lunch to spice up a weekday! Ahhh Rocco, you little scallywag! PS Good on you Ford for supporting Bloggers. Dem smarts car people. You were really speeding to a dentist's appointment? Eh, what am I saying? I speed everywhere. No exceptions. Rocco - what a character he is. The teenage years should be very joyful. Sorry I missed your last post but I'm glad life has gotten a little brighter. Seriously, got a good giggle about Rocco stealing the apple and I totally sympathize about the banking issues. Can NOT wait to see you in San Diego. Oh God, you sooooo make me want to sell my soul to 'the man'. Or just be more like you. More confident. More out there. More...ballsy. Ugh. I is what I is, though. My Joel would have nicked the green too. I love the way you write ...that is all. I can't wait to hear about BLOGHER sdventure. Glad Rocco enjoyed the pristine apple. I was saving mine for afternoon tea, which Lacey must have guessed cos she got it and threw it hard on to the floor to give it a little 'character'. The apple remains uneaten now. Next time you come to Melbourne stay longer and come see us! Bring your boys. Rocco and the spoodle can chase each other around the yard. I have only just discovered you, but you sound like all kinds of fun. :) Count me in! I often drop by and read your posts and it astounds me how honest you are and how 'real' you sound. Sounds stupid when I write it like that but I guess your 'realness' is what keeps us coming back. You go girl - you inspire all of us to be more real! I love shiny apples. I don't so much like planes or flying. Go with the bloggy flow, roll with the functions. It's all swings and roundabouts, isn't it, after all? Loads of love. And I hope by now things are at least a little bit back to status quo at yours??? hi fellow blogger, looks like fun. Have a great time.